Following Charles Lindbergh’s trans-Atlantic flight in May 1927 and increased interest in airplanes, Hood River began to feel the need for an “aviation field.” In September 1927, Colonel Lindbergh himself flew up the gorge from Portland in his famous Spirit of St. Louis, passing low over the new Bridge of the Gods, banked his plane and in a dramatic show of barnstorming, flew under the bridge and headed back to Swan Island. Pioneer Oregon flyer, Tex Rankin, came to town to promote an airfield, saying, “the Columbia Gorge is virtually a gigantic tunnel, the only outlet for planes to go to the east.” A Chamber of Commerce committee presented this need to the Hood River County Court in October 1927, after planes had passed over the town September 30 during two air races from Spokane to Portland. Mail was being carried by plane through the Columbia River Gorge. One disabled craft had been forced to make an emergency landing on the long sandbar in the Columbia River below the town, and that location was considered as a possible field. However, it was not always accessible to the town. By the end of 1927 the County Court had agreed to donate use of land on a flat field west of town, which is now the site of the County workshops on 18th Street. The City leased an adjoining tract for $200 a year to make an 11-acre landing field. An additional $140 was spent for water pipe. On March 4, 1928 American Legion members and other volunteers leveled and marked the field. Rocks painted white outlined the runway. 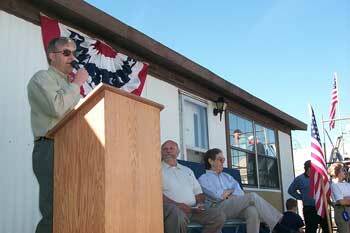 The American Legion was to be responsible for the field’s management. The following day it was dedicated in memory of Lucien Carson, a flyer from Hood River who lost his life in World War I. Over 2,000 people attended the dedication and first “air circus” was held in Hood River on that day. As the residential area spread around the field and the number of planes increased, there were complaints to the County Court of noise, dust and danger from aircraft. Night landings also became the town’s concern. When a plane buzzed the area as a signal, citizens with autos hurried to line the strip, illuminating the landing field with their car lights. In 1931, the County Court ordered that use of the property for aviation commercial and passenger-carrying purposes be discontinued, with landings limited to refueling and emergencies. An offer of land on the west of the lower valley about one mile south of Hood River was made in 1934. At that time counties were without authority under law to establish and operate airports, but such authority was granted to cities and towns. However, since the 1930s were Depression years, the City of Hood River was unable financially to proceed without federal help, which did not come. The Civil Works Administration and Department of Commerce representatives looked over the situation but no action was taken. Meantime, the long, fairly smooth sandbar in the Columbia River below town served as a passable landing place. But is was not accessible to the town and, if it was high water time, the bar disappeared, which it finally did forever when the water rose behind Bonneville Dam in 1938. Hood River was without an airport of any kind until 1945 when Mel Lingren and Ormand Hukari, joint owners of a 1940 65-hp Taylorcraft plane leased 80 acres of pasture, owned by dairyman Eugene Wright, on the lower west side of the valley. The men selected this site because of its potential for future enlargement. The east boundary of the land was Orchard Road. Members of the Civil Air Patrol who had been active during World War II years helped prepare the field and clear trees at the east end of the runway in exchange for use of the airstrip. On the west end, a gap in the trees was cut for aircraft clearance. By 1946 there was increased pressure on the County to establish a municipal airport facility, which it did, taking over ownership and operation of the property and purchasing additional tracts adjacent to the makeshift strip to make it available and safer for larger aircraft. The County purchased additional land in 1960. In 1947 Mel Lingren bought a Stearman biplane, had it equipped for agricultural spraying and started a business he later sold to Don Decker in 1970. He also provided a charter service until 1976. By 1952 the turf runway field was 1,960 feet long. A small hangar occupied by planes belonging to Mel Lingren, Dr. Stan Wells and Riddell Lage was constructed first. Keith Kerr, former Air Force pilot, built a mechanic shop where he and Bill Kesti repaired planes. Eileen Kesti had been a WASP during the war, ferrying planes for the Air Force. On a Thanksgiving Eve, a windstorm lifted the hangar and turned it over; only one of the three planes inside was damaged. In 1959 the FAA gave permission for hard surfacing of the airstrip. The County transferred ownership of the airport to the Port of Hood River effective January 1, 1976. It was felt that the Port was better equipped to operate the facility and to handle budget items without involvement of tax dollars. The Port immediately purchased 35 acres adjacent to the airport for $80,000, approximately doubling the size of the property for airport use. The County agreed to clear air easements for surrounding property as a term of the ownership exchange. Work revolved around getting the airport into compliance with FAA so that it could receive federal and State Aeronautics funding for projects. More property was purchased and several projects were completed in the 1970s. In 1976, a hangar was constructed to house aircraft owned by SDS Lumber Company. The Forest Service signed a long-term lease for a surveillance center for air coverage of the Mt. Hood National Forest during seasons when fire danger was high. During 1979, projects completed included a new spray operator hangar, two 12-unit T-hangars, construction of a parallel taxiway, rehabilitation and extension of runway to 3,040 feet, addition of low intensity runway lighting system, and construction of tie-down area. During the 1980’s two 12,000-gallon fuel tanks were installed and all the T-hangar spaces were leased leaving a long waiting list. Aviation easements were secured and landscaping and safety improvements were completed. A letter was received by a Seattle pilot telling of having mechanical problems and how he was able to find Hood River Airport because of the airport policy of all-night runway lighting. A new Airport Master Plan was released in 1994, outlining three phases of improvement to be completed by 2011. Construction of 12 new T-hangars was completed in 1997, boosting the site’s indoor storage to 36 planes. Also occurring at this time with the help of an FAA grant of $397,000 was removal of underground fuel tanks, construction of a north access road, additional runway and taxiway construction and sealing, fencing, and painting and striping of runway and taxiway. Each year the airport hosts a fly-in show and exhibition, which is enjoyed by many area residents. The airport is now a Basic Utility, Stage II Airport, serving 95% of the single-engine and small twin-engine airplanes used for personal and business purposes. With approximately 90 aircraft based at the facility, the airport handles about 14,000 operations annually and is coming closer to self-sufficiency each year as it anticipates continued growth and improvements. 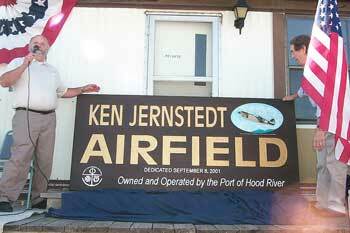 By resolution, the Port Commission changed the name to Ken Jernstedt Airfield on June 19, 2001. 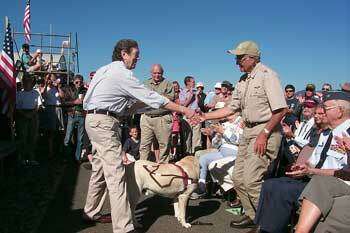 The dedication ceremony was held September 8, 2001. The latest Airport Master Plan began development in 2002, with input from the public and users. Hood River County will review the Master Plan in 2008 with the objectives of operational safety, facility upgrades, and long-term viability of the airport through employment development, historic aircraft, flightseeing, and flight training. A top goal of the review will be to look at the alignment of the airport and County transportation planning objectives, including economic development, streamlining planning and zoning processes and establishing intergovernmental agreements to accomplish those goals.